What a wonderful place to spend the day. 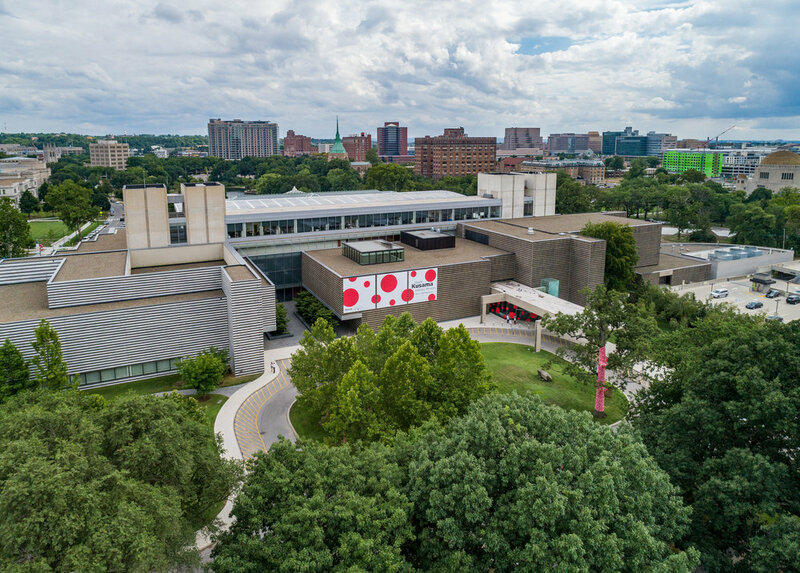 Visit University Circle for many ideas on what to see and where to go. Click here to view more aerial photos of University Circle! Aerial videos have been the top, affordable and fastest source of marketing for tourism. Different niches acquainted with travel like hotels, resorts, travel agencies and adventure spots to iconic landmarks and lifestyle destinations are tapping into drones to boost their tourism marketing. Instead of the traditional fly by plane or helicopter to get a good aerial shot which costs thrice as much, marketers can now do away with this expensive technique that requires more manpower and replace it with just one person controlling a drone from the comforts of their establishment. Drones are affordable, handy and can be controlled by one person registered as a drone pilot with a commercial license for carrying out your promotions. This is a good investment that won’t cost you a million. Aside from this, your drone pilot can get prior training in just a week or less from supporting drone companies. Far from being a fad, the drone business is sure to last for years considering its user friendly and convenient features. The Glass Window in the Bahamas. Aside from travel businesses benefitting from drone marketing, numerous government tourism offices and environmental protection organizations can promote a cause that can go viral with the use of aerial videos that explain how travelers can come to a place with the right knowledge about how to go about with their destination. Videos receive the biggest clicks and likes on social media. Aerial videos make the difference all the more because aspiring travelers get to see a 360 degree perspective of what the place is all about in just minutes. This helps get more conversion in online travel bookings at a much faster pace. Drones have the capacity to get unique angles without limitations especially when its flying on the air and require minimal setup unlike traditional videography gadgets so there’s more room for a good video story. Aerial videos offer your potential customers with a thrill of a lifetime by capturing real life adventures caught by the drone that encourages professionals and students to travel more often. If you’re planning to get started with your own tourism promotions, then it’s time to put your skills and your money to good use with commercial drones that fit your budget. There are plenty of drones in the market that are well suited to different travel industries at affordable rates. 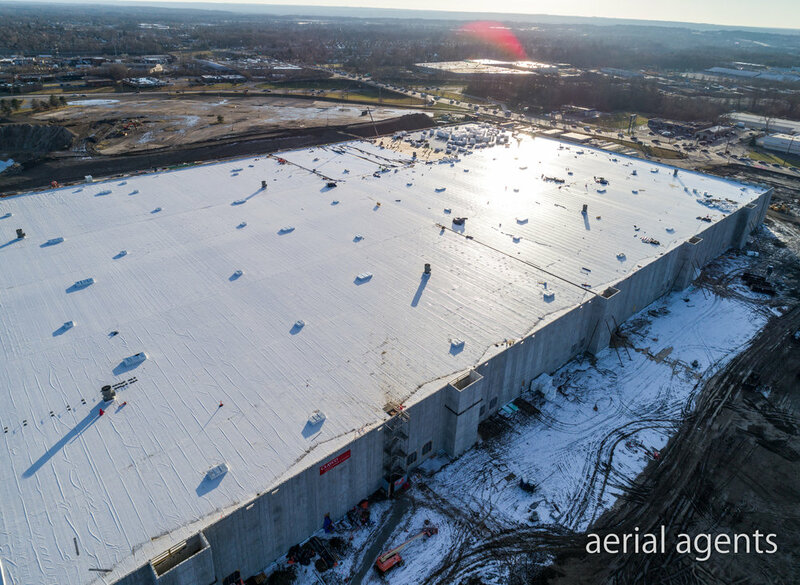 NORTH RANDALL, Ohio - The main structure of the new Amazon fulfillment center in North Randall is just about complete and it is ENORMOUS. Clayco Construction company has been working on this project since August 2017. Below are some photos shot earlier in the planning stages of the project. Aerial Photo of Randall Park Mall in the 1970's. This new operation is bringing 2,000 new full-time jobs to the former Randall Park Mall location. A 10-story hotel built by mall developer DeBartolo Corp. in North Randall in 1973 on a site next to the former Randall Park Mall has been acquired by an affiliate of Industrial Commerce Properties Corp. of Solon and Industrial Realty Group of California as part of the massive Amazon warehouse project. Through S.L. North Randall Site One LLC, developers Chris Semarjian and Stuart Lichter, respectively, closed on the purchase of the property at 4600 Northfield Road from the Village of North Randall on Friday, Oct. 6, according to Cuyahoga County land records available online Monday morning, Oct. 9. Semarjian said in a phone interview the pair plan to raze the hotel and sell sites on the five-acre parcel to food-related and other retailers that might be attracted by the $177 million fulfillment center that the Seattle-based e-commerce firm is having built next door. The center is expected to employ 2,000 people when it opens, perhaps as early as the second half of next year. Asked why the redevelopers of former corporate headquarters and industrial plants were willing to undertake such a task, Semarjian said, "Amazon will be a very large neighbor that wanted to see the hotel go away. This made them more comfortable with the site." Watch the video below to see our perspective of the Randall Mark Mall demolition. For most photographers, it is really difficult to get your work noticed because the internet is such a noisy place. There is one platform that will allow your work to stand out and get noticed (for now.) That is Google Maps. This site is intended as a review site for most area business that allows users to rate it from 1 to 5 stars, but it also allows for crowdsourced photos. Most photos on this site are not taken by professional photographers, but rather by amateurs. This format makes for a LOT of unflattering food photos with bad lighting or exterior shots that are just plain poor quality. Google Maps has over 1 Billion users and is consistently in the Top 10 most popular apps in the App Store and Google Play store. Google Maps has even developed a program for their contributors to receive rewards for the contributions. This program is called Local Guides. 1. Bring Value to your clients/attract new clients - So you have just been hired by one of your first clients. A new hospital in your market needs photos of their brand new building and location for their newsletter. You complete the mission, deliver the work, and receive your payment for the job. You may also want to share your work with your own audience via Facebook, Twitter, Instagram, etc. Don't forget about Google Maps! You can add your photos to your new customers listing for them. They will appreciate the added value that your service offers and the extra effort you took to complete the task. You will get the views from all of the people who need directions to the new hospital. All of the other community businesses will contact you and request your services for their new building. All of the architects, landscapers, parking lot pavers, roofers, and construction companies will also be calling you to buy a license to use the photo in their marketing efforts. This exact instance happened over 25 times at Aerial Agents. 2. Improve the quality of the listing for everyone - Let's face it, the street view perspective was cool at first. But now the quality of the camera is so poor that it doesn't do the listing much justice. In some cases, you will get an up close and personal view of a dumpster for a hospital! With the help of drones, you can be the "Street View of the Sky". 3. Feature your work at high profile locations - THIS! is very valuable. Here is why...Let's say an older luxury hotel calls a few roofing companies for a quote to repair the roof. The estimator takes down the address and punches it in to google to see how far away it is. The roofing company also wants a view of the condition of the roof via a satellite view. They happen to see your photo as the cover of this hotel's Google Maps listing, an awesome aerial shot that shows the roof perfectly. They WILL call you once their work is complete to get a finished photo of their work. I have earned over 13 roofing clients just from this scenario alone. Sometimes you might just luck out and get the cover photo for Menlo Park, California, the Home of Facebook. 4. Historical Documentation - This ideal is slept on way too much by so many. Historical Documentation is very important to future generations. If you can accurately capture the way a certain property looks today, it will be very valuable 10, 20, 50, 100 years down the road. Think long term for your work. 5. Notoriety, Rewards, Credibility - Although Google offers rewards and praise for contributing to their site, the real value is in the credability that you will earn amongst your prospects. You will notice that after a while, you will start to get calls, emails, and DM's from area businesses or marketing managers that need your services. You set your own price. Because after all, you are the only one in your market that is doing this. Think BIG. 7. Improve your photography - Once you know that your image is going to be seen over 100,000 times, you tend to focus on creating the best work you can. Pretend like your idol is going to see your work and shout you out on Instagram to praise you. 8. Improve Brand Awareness - The better the photo, the better the awareness. Once you add a great photo to a place, the business owner will praise you publicly! I've had world renowned chefs shout me out on their Instagram for providing such an awesome photograph that I wasn't even asked to shoot. It was a pleasant surprise. All of the sudden, Aerial Agents were the cool kids on the block. 9. Gain more Experience on the Controls - If you want to be the best at what you do, you have to act like it. I mean you have to want it badly. This includes adopting the Black Mamba mentality. First to arrive, last to leave. Fly, Shoot, Edit, Repeat. Become the best version of yourself through lots of hard work. 10. Build your Portfolio - Even if you shoot places that didn't hire you to shoot for them. Places like landmarks, parks, churches, hospitals, city hall, etc. You will notice that the quality of your portfolio will improve over time. Eventually, you might start to grace the cover of a magazine and other publications. 11. Free Advertising - What if your photography could be the cover image to every location in your market?!? What if you (or your work) could be everywhere? You would definitely set yourself apart from the rest of the crowd. This method has garnered Aerial Agents many new clients. Because of this, we have saved money in advertising, and now the time we've invested into this does the rest of the work for us. The all new Tom Benson Hall of Fame Stadium in Canton, Ohio looks amazing! 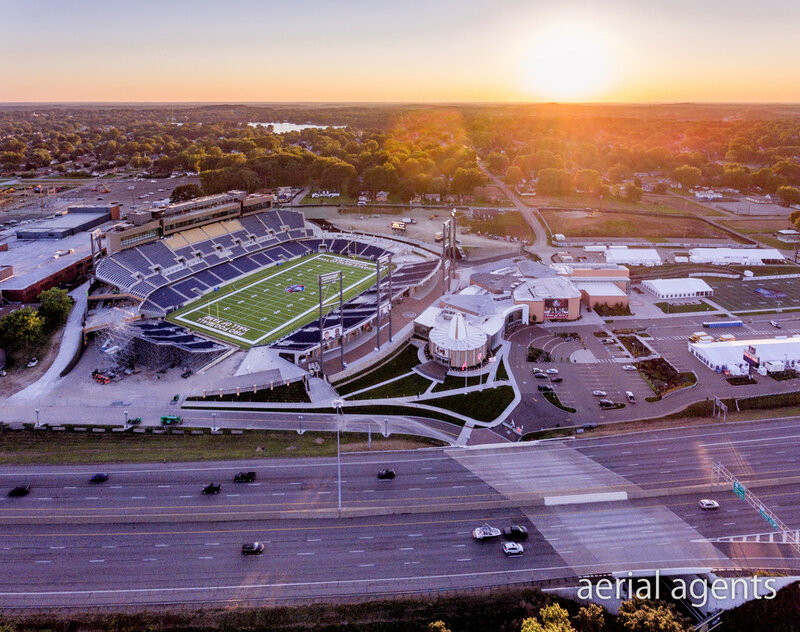 So many updates to the newly renovated Johnson Controls Hall of Fame Village, a world-class and state-of-the-art $700 million development of the Pro Football Hall of Fame’s campus being spearhead by the Hall of Fame and Industrial Realty Group. Johnson Controls Hall of Fame Village is a project that aligns with Hall of Fame’s Mission, Values and Vision and its standing as “The Most Inspiring Place on Earth!” for all those who will play the Game, played the Game and love the Game. The foundation for a wide-ranging array of programming will be the Hall’s five core values – commitment, integrity, courage, respect and excellence – that can be learned from the Game. The venue will be a spectacular sports and entertainment complex that will include a permanent stage built into the stands. AEP Ohio, a unit of American Electric Power and AEP Ohio Transmission Company Inc., installed custom transmission structures designed to resemble football field goal posts as part of a $7 million project to improve reliability for customers and strengthen the power grid in the Canton, Ohio, area. Eight state-of-the-art turf fields that will be multi-purposed, lighted and equipped with the latest technology and video capabilities. The sports complex will include full world-class amenities, a football sized concourse area and a championship field with 3,000 seats. Three fields opened in 2016, will grow to five in 2017 and the complex will be completed in spring of 2018. An independent economic feasibility study was completed in May 2015 that indicates Johnson Controls Hall of Fame Village will have a dramatic impact on the region and state for decades. During its peak year, the project will create more than 13,000 new jobs; and over a 25-year period, Johnson Controls Hall of Fame Village will generate $15.3 billion in cumulative net new total economic output within Stark County, home of Johnson Controls Hall of Fame Village. Watch the drone video below to see the entire Hall of Fame village from all angles.